Teach from any angle with all of your accessories in tow with Portable Magnetic Classroom Whiteboards. These dry-erase boards on wheels are ideal for any educational environment, and turn any place into a learning space. The whiteboard surface doubles as a magnetic bulletin board and includes a blow-molded plastic accessory tray for markers and erasers, and four recyclable plastic tubs for larger items. 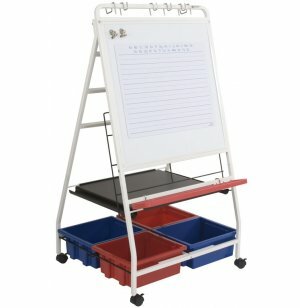 A convenient magnetic accessory pad with permanently fused penmanship lines makes these mobile whiteboards a great option for young students who are perfecting handwriting and spelling. Tired of arranging and rearranging your classroom so students are properly positioned to view the board? 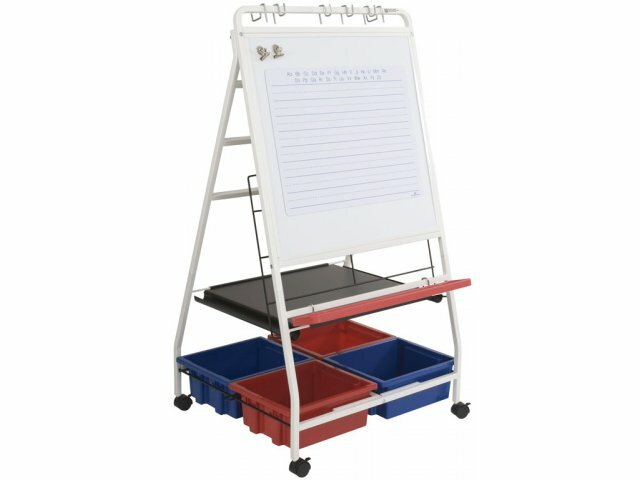 Mobile whiteboards roll into position, offering a convenient way to ensure that board-work remains visible to all students and accessories are always close at hand. Multi Function: The dry-erase board doubles as a magnetic bulletin board. A magnetic accessory pad with permanent penmanship lines makes it easier for students to write correctly. Versatile Design: A wire big-book holder keeps books visible so that teachers do not have to constantly hold them up. Convenient Storage: Includes a red blow-molded plastic tray for dry erase markers and board erasers, as well as four recyclable plastic tubs for larger equipment or accessories. Easy Mobility: These whiteboards roll into place on 2" locking casters.